Barry’s has transformed every aspect of my life. It built my confidence, pushed me to my personal limits, and taught me to live fearlessly. Without this foundation to build upon, I could have been ruined when I was fired from Corporate America. 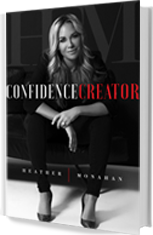 Instead, I pivoted and took a leap of faith writing my new book, Confidence Creator, and sharing what I have learned in the red room alongside my Barry’s family. Writing this book has been the biggest risk in my professional career and has scared me more than running at Barry’s on a 12.5 in Rachel’s class but sometimes the scariest things are the ones that pay the biggest dividends.